Last week's challenge, from listener Peter Gordon of Great Neck, N.Y.: Think of a name in the news that has a doubled letter. It's a person's last name. Change that doubled letter to a different doubled letter, and you'll get the commercial name for a popular food. What is it? Winner: Marylka Pattison, of Tuscon, Ariz.
Next week's challenge, from listener Ken Stern of Brooklyn, N.Y.: Think of a sign that's frequently seen around this time of year — two words of four letters each. Among these eight letters all five vowels — A, E, I, O, and U — appear once each, along with three consonants. What sign is it? If you know the answer to next week's challenge, submit it here. Listeners who submit correct answers win a chance to play the on-air puzzle. Important: Include a phone number where we can reach you Thursday, Nov. 10, at 3 p.m. ET. Daylight saving time ended last night, so time to put that extra rest to good use. Let's play The Puzzle. MARTIN: I am joined, of course, by the puzzle editor of The New York Times and WEEKEND EDITION's puzzlemaster, Will Shortz. Good morning, Will. MARTIN: You feeling energized? You feeling ready to go? You feeling ready to puzzle? SHORTZ: You know - yeah, yeah. I wish every day had 25 hours. SHORTZ: I would love that. MARTIN: I wish we could make that happen. Yeah, get back to me on that. So remind me of last week's challenge. SHORTZ: ...And doing very well in Utah. And change the two L's to F's and you get McMuffin, which you can get at McDonald's. MARTIN: Of course. So we got a 180 correct answers. And our randomly selected winner this week is Marylka Pattison of Tucson, Ariz. She's on the line now. Hi, Marylka. Thanks for being with us. Congratulations. MARYLKA PATTISON: Thank you, Rachel. MARTIN: How'd you get the answer? PATTISON: I'm actually an Evan McMullin supporter, and I actually thought of - I thought, oh, presidential race news, and I went through Trump and Clinton, and I thought no food. And I felt stupid that I didn't get McMullin - that he wasn't my first try - but it came pretty fast. MARTIN: Interesting. Well, now - and you're living in a swing state, now, Marylka. MARTIN: Arizona is now a hotly-contested battle state. PATTISON: I know. I don't know if that's good or bad because I obviously don't support either one of the major candidates (laughter). MARTIN: Well, it's been a complicated election cycle. MARTIN: It's almost over. It's almost over. So are you someone who does a lot of puzzles? PATTISON: I try to listen to the Sunday Puzzle every weekend, but I also love those Sunday talk shows and interview shows 'cause I'm kind of a political junkie. So I have to have an alarm saying, oh, it's time for The Puzzle to come on. And I turn off the TV and listen to The Puzzle. MARTIN: Oh, I'm so glad. I'm so glad to hear that. OK, well, with that, Marylka, are you ready to play The Puzzle? MARTIN: OK, Will, take it away. SHORTZ: All right, Marylka and Rachel, I'm going to name some categories. For each one, I'll name something in the category that closely follows the name of the category alphabetically - for example, states and Texas. You tell me the only other thing in the category that fits between these two things alphabetically. And in the case of the examples, you would say Tennessee. It's the only state between states and Texas. SHORTZ: All right, number one is seasons, summer. SHORTZ: Spring is it. Number two is digits, five. PATTISON: Shoot. Digits, five - D-E-F.
MARTIN: Oh, no, but I like how you're thinking. SHORTZ: ...Very clever. Very clever. I'll give you style points for that. The answer is eight, but I'll - I like your answer. MARTIN: Finger's really good, Marylka. SHORTZ: (Laughter) That's a digit. SHORTZ: Yeah, smell. That's it. SHORTZ: Colors of the rainbow, indigo. SHORTZ: Green is it. Original 13 colonies, Rhode Island. PATTISON: So O is - it's between O and R? SHORTZ: Yes. Central American countries, Guatemala. SHORTZ: Costa Rica, good. Poker hands, straight. PATTISON: I don't play poker. Let's see - P, S.
SHORTZ: I'll give you a hint. It's the very best poker hand you can have. PATTISON: Is that, like, all aces? I have no idea. I really don't. PATTISON: Rachel, I do need help. MARTIN: Best hand - the best hand. SHORTZ: Starts with an R.
MARTIN: Oh, it starts with an R. Royal flush? SHORTZ: Yeah, royal flush. There you go. PATTISON: OK, thank you. I never would have gotten that. PATTISON: Somewhere between CH and CH. SHORTZ: Chlorine, yeah. And here's your last one - Major League Baseball teams, Marlins. SHORTZ: It's got to start with M-A. PATTISON: Can you tell me the state? SHORTZ: Yes, it's in Washington state. PATTISON: Why does that not help me? PATTISON: Oh, thank you - Seattle Mariners. I should have gotten that. MARTIN: Oh, man. I know, that was embarrassing. I used to live there, even. Sorry. Sorry, Seattle. Sorry, Mariners. MARTIN: Yeah. OK, that was excellent. You did a very, very good job, Marylka. For playing The Puzzle today, you get a WEEKEND EDITION lapel pin and puzzle books and games. You can check out your prizes at npr.org/puzzle. And what's your public radio station, Marylka? PATTISON: It's KUAZ at the University of Arizona. MARTIN: Marylka Pattison of Tucson, Ariz. Marylka, thanks so much for playing The Puzzle. PATTISON: And thank you very much. MARTIN: Will, what's up for next week? SHORTZ: Yes, the challenge comes from listener Ken Stern of Brooklyn, N.Y. Think of a sign that's frequently seen around this time of year, two words of four letters each, and among these eight letters, all five vowels - A, E, I, O and U - appear once each, along with three consonants. What sign is it? So again, a sign that's seen frequently around this time of year, four-four, and out of these eight letters, all five vowels appear exactly once. What sign is it? MARTIN: When you have the answer, go to npr.org/puzzle and click on the submit your answer link - just one entry per person please. Our deadline for those entries is Thursday, November 10, at 3 p.m. Eastern Time. Don't forget to include a phone number where we can reach you at about that time. And then if you're the winner, then we call you, and then you get to play on the air with the puzzle editor of The New York Times. 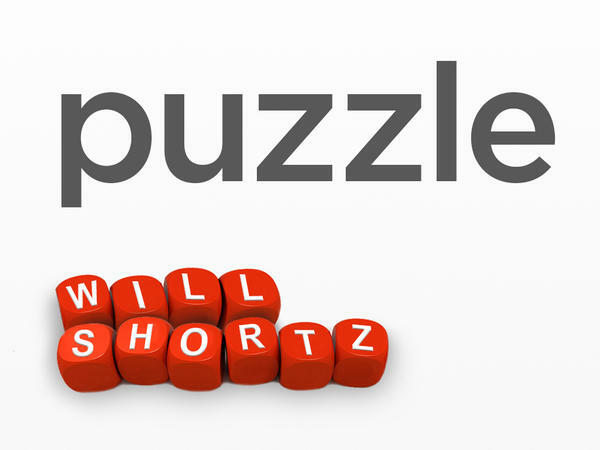 And he is WEEKEND EDITION's puzzlemaster, Mr. Will Shortz. Thanks so much, Will. SHORTZ: Thanks, Rachel. Transcript provided by NPR, Copyright NPR.